My Very Own Playhouse(TM) are hours of fun. There are several models to choose from. For children 3 and up. One piece construction easily expands to a large 4.5' x 3' x 4' tall play and activity center large enough for adults to join in on the fun. Includes 8 colored markers for custom coloring inside and out. Durable cardboard construction creates a sturdy play area with rounded corners and wavy edges for safety. The Cottage Playhouse is great for birthday parties, sleepovers, classroom activities or the perfect gift. Folds down to 21" x 35" x 3" for easy storage in the original box. A fun experience children will remember for years! Medieval play has never been more fun. Children will spend hours playing prince or princess, queen or king, and even pirate with their own HUGE Castle. Endless tales will be acted-out bringing dragons to life, gazing into the wizard's crystal ball, hunting treasures, practicing for knighthood and even decorating their own coat of arms. 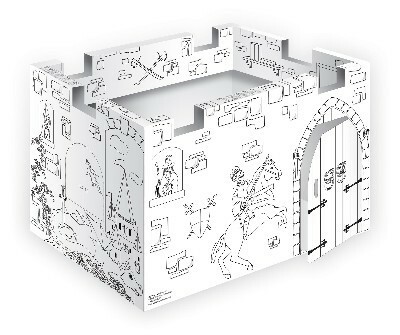 Constructed of sturdy cardboard, the single-piece castle folds up and down in two easy steps. 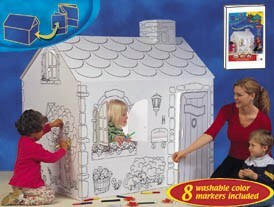 Kids' imaginations come to life as they color their very own castle with the set of 8 jumbo washable markers included. Hungry for fun? Ready to shop? Open the doors and step into My Very Own Grocery(TM), the store that's all yours! Buy, sell, and stock the shelves! Color the awning, paint the walls, check out customers, set your own prices, make a home delivery, or feed the whole neighborhood. Make your grocery list, check it twice, and get everything you for a quick snack or a week of meals. 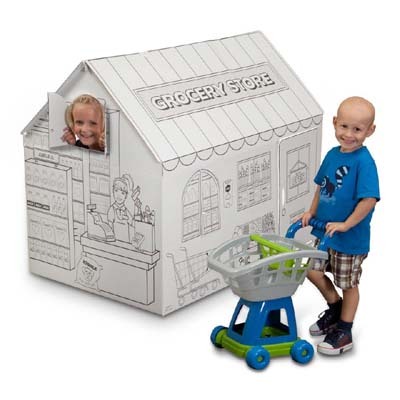 This cardboard playset unfolds in minutes for hours of fun as clerks, cashiers, and customers! Aarr! Aspiring buccaneers will board this pirate-themed boat to sail through unchartered waters on a search for hidden treasure. Drop anchor and take part in a treasure hunt on the seven seas. Battle the enemy in a sword fight and make em walk the plank, matey! 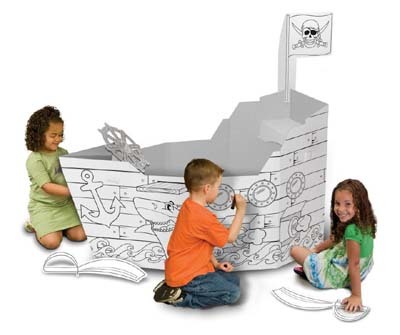 Decorate the ship with markers, paints or crayons, construction paper, gems and jewels. Once inside, children can embark on their very own search for buried treasure at sea as they steer the ship and follow treasure maps. Shiver me timbers! Ahoy mates! Young pirates create the rules for the sea and steer their very own ship as the follow a treasure map in search of sunken treasure. Brave crewmates can dodge danger and have sword fights during their swashbuckling adventure. Can you find all the items hidden in the graphics? Diamond rings, Banana, Baseball and Bat, Umbrella, Whistle, Comb, Ruler, just to name a few! Children will spend hours searching for the hidden items cleverly disguised in the graphics of this cozy playhouse! Playing house is always fun for kids and even more so when they get to decorate it themselves. 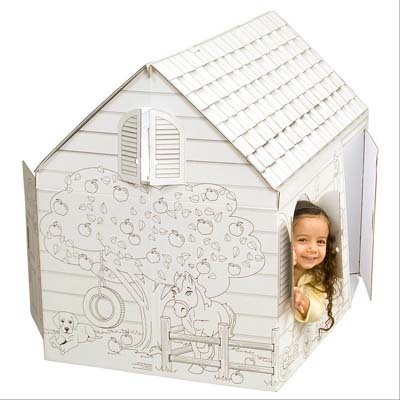 Constructed of sturdy cardboard, the single-piece playhouse folds up and down in one easy step. These playhouses are MADE in USA! Because we care about your child's real world as much as their imaginary world, our products are made from bio-degradable, eco-friendly materials that are formaldehyde-free and completely recyclable.